A chart is a graphic that displays numeric data in a compact, visual layout and that reveals essential data relationships. You can add a chart to a form/report to visualize your data and make informed decisions. You can bind the chart to a table or query and customize the chart with a variety of properties. You can even make the chart interactive. For example, if you select a different category field on a form or report filter, you see different chart values. In Access, you can create column, line, bar, pie, and combo charts. Binding the chart to a data source (such as a table or query). Mapping the fields to the chart dimensions, which are the main elements of a chart. The Axis (Category), Legend (Series), and Values (Y Axis) dimensions are laid out in different ways depending on the type of chart. Adding additional chart elements (such as data labels and trendlines) to enhance and clarify the chart. Formatting the chart and its various elements. You can also format individual data series, which are a set of values in a column, bar, line, or pie slice that correspond to the chart legend. Create or open a form or report in Design view. To create, select Create > Form Design or Report Design. To open, right click the form or report name in the navigation bar, and then select Form Design or Report Design. Select Design > Insert Chart , select a chart type, and then drop it on the form or report. For more information, see Choose the best chart type for your needs. The Chart Settings pane opens and a sample diagram is displayed in the Form Design grid. Use the Chart Settings pane to configure the chart's data source, select the Axis (Category), Legend (Series) and Values (Y Axis) fields, and format the chart. Select the Data tab of the Chart Settings pane. Select Tables, Queries, or Both, and then select a data source from the drop-down list. Pass-through queries are supported. By default, the sample diagram is replaced with a live chart that uses the first two fields in the data source as the Axis (Category) and Values (Y axis) dimensions. Often the first column in a table is a primary key, and you may not want to use that as a dimension in a chart. The chart property, Preview Live Data, controls whether you see live data. Tip if your data source has many fields, you may find it easier to create a query that limits the fields to just the ones you want so you can simplify the field selections. Axis (Category) Under this section, select one or more fields. 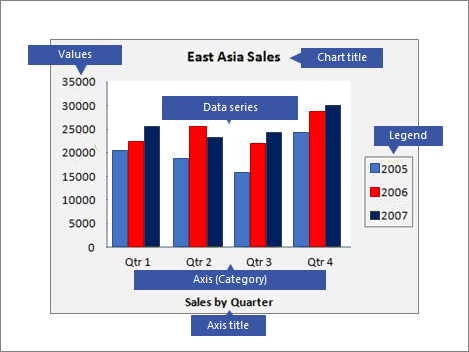 This chart dimension shows horizontal values in an XY chart layout in a clustered column and line chart, and vertical values in a clustered bar chart. The default aggregation of a date field is Months. To change it, click the down arrow and select from the list, including None to remove the aggregation. When you select more than one Axis (Category) field, it creates a hierarchy of tick marks along the dimension line (such as States within a Division). Legend (Series) Under this section, select a field. This chart dimension pivots field values into column headings. For example, values in a State field are transposed as column headings and each becomes a separate data series. Values (Y axis) Under this section, select one or more fields. 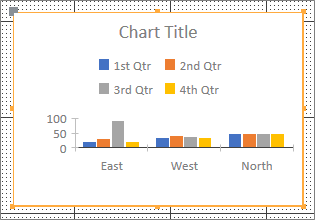 This chart dimension shows vertical values in an XY chart layout in a clustered column and line chart, and horizontal values in a clustered bar chart. Each field you select corresponds to a data series. When you select two or more Values (Y axis) fields, you can’t select a Legend (Series) field. The Values (Y axis) fields become the legend by default. By default, each selected field is aggregated. For numeric and currency fields, the default aggregation is Sum. For all other fields, the default aggregation is Count. To change the aggregation, click the down-arrow, and select from the list, including None to remove the aggregation. Note Text fields must use the Count aggregation. All selected Values (Y axis) fields must either be aggregated or nonaggregated. At a minimum, select at least one Axis (Category) and one Values (Y axis) field. You can only select one Legend (Series) field, but you can select more than one field from the Values (Y axis) or Axis (Category) sections. If you select one Axis (Category) field and one Legend (Series) field, you can only select one Values (Y axis) field. To add an extra Values (Y axis) field, clear either the Axis (Category) or Legend (Series) field. If you select a Legend (Series) field, select only one Values (Y axis) field and it must be aggregated. Select the Format tab of the Chart Settings pane. Select a Data Series from the drop down list. Display Name The name of the Data Series in the chart legend. Chart Type This property only displays for a Combo chart. Use this property to add different chart types to the Combo Chart, one for each data series. The default Combo Chart combination is Clustered Column for the first data series and Line for the second data series. You can set a different chart type for each data series. If the chart has only a single data series, it is Clustered Column. Note Avoid confusing this property with the Chart Type property in the chart property sheet. Line Weight Select a line weight in increments of .25 points. This property only displays for a Line chart. Dash Type Select a line type of Solid, Dash, Dot, Dash Dot, or Dash Dot Dot. This property only displays for a Line chart. Plot Series On Select a primary or secondary axis to plot a data series. Use this option when chart data series vary widely or are different measures (such as price and volume). A Combo chart of clustered column and line that also has axis titles often works best. Missing Data Policy Select one of the following: Plot As Zero to represent missing data as 0, Do Not Plot to ignore missing data, and Plot as Interpolated to calculate new data that fills in missing data. This property only displays for a Line chart. Series Fill Color Select a color to fill the data series, such as a column or bar. Series Border Color Select a color to add an outline to the data series, such as a column or bar. Display Data Label Select this option to display a data label that clarifies the data series. 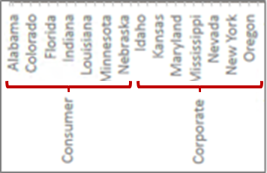 Display Trendlines Select this option to display a trendline, which is a way to show data tendencies. Linear This is a best-fit, straight line for data sets that increase or decrease at a steady rate. Exponential This is a curved line of positive numbers rising or falling at constantly increasing rates. Logarithmic This is a best-fit, curved line of rate-of-change data that quickly increases or decreases, and then levels out. Polynomial This is best used when your data fluctuates, such as gains and losses over a large data set. Power This is a curved line of positive numbers that increase at a specific rate, such as acceleration at 1-second intervals. Moving Average This is a way to even out fluctuations in data and show a pattern or trend more clearly. Trendline name Enter a name that is more meaningful and that displays on the chart legend. Marker Shape Select a shape as a line marker. This property only displays for a Line chart. For more information, about data aggregation, see Make summary data easier to read by using a crosstab query. Properties To further customize the chart, select Design > Property Sheet > <Chart name>, which displays all the chart-related properties. Press F1 on each property to get help on that property. When you modify a property in the Property sheet, the corresponding value changes in the Chart Settings pane and vice versa. There are many Format properties unique to charts. you can use these to format axes values, titles, and the chart. There are also several Data properties unique to charts, including Preview Live Data, Transformed Row Source; Chart Axis, Chart Legend, and Chart Value. Adding a secondary vertical axis When you create a chart, there is usually a primary vertical axis, but you can add a secondary vertical axis when data varies widely or to plot different measures, such as price and volume. The scale of the secondary vertical axis shows the values for its associated data series. To add a secondary vertical axis, use the Plot Series On property on the Format tab of the Chart Settings pane. Adding a trend line For numeric data, you may want to add a trend line to show data tendencies. You can use the Trend Line and Trend Line Name options on the Format tab of the Chart Settings pane. Modify the chart To modify a chart, open the form or report in Design or Layout view, and then select the chart which opens the Chart Settings pane. To switch to a different chart type, select a different chart from the Chart Type property drop-down list. You can also change any single chart to a Combo chart by changing the Chart Type property on the property sheet (and not the Format tab of the Chart Settings pane). Refresh source data To refresh chart data, switch to form or report view, select the chart, and then select Refresh All (or press F5). Chart Settings If the Chart Settings pane is closed, make sure the chart is selected, and then select Design > Chart Settings. Classic chart Avoid confusing the new chart , which is based on modern technology, with the classic chart , which is an ActiveX Control. However, you can still use the classic chart and even add it to a form or report that has the new chart. To make a chart interact with the data on a form or report, bind the chart to the same data source as the form or report. Then set a matching field for the Link Child Fields and Link Master Fields data properties of the chart. Create a form or report bound to a data source. For more information, see Create a form in Access or Create a simple report. Add a chart to the same form or report. For more information, see Create a chart. Make the Record Source property for the chart the same as the Record Source property for the form or report. Click the chart, open the chart Property Sheet by pressing F4, and then click the Data tab. Click the Build button in either the Link Child Fields or Link Master Fields property box. In the Link Master Fields and Link Child Fields , select the field that you want to link, and then click OK. It’s often best to use a category field, such as a State, Segment, or Region. If you are not sure which field to use, click Suggest for recommendations. Save the form or report, switch to Form or Report view, and then verify that the chart works as expected. For example, filter the form or report by a category field, such as State, Segment or Region, to see different results in the chart. For more information, see Apply a filter to view select records in an Access database. The following sections provide background information about charts and help you decide which chart to use. A chart is a graphic that displays numeric data in a compact, visual layout and that reveals essential data relationships. A chart has many elements. Some of these elements are displayed by default, others can be added as needed. You can change the display of the chart elements by resizing them or by changing the format. You can also remove chart elements that you do not want to display. The following diagram shows the basic chart elements. What charts can you create? In Access, you can create column, line, bar, pie, and combo charts. This section explains each chart and its best-use scenarios. In a column chart, categories display along the horizontal axis (Axis (Category) property) and values display along the vertical axis (Values (Y axis) property). Typically, you choose one field for the Axis (Category) dimension and one or more fields for a Values (Y axis) dimension, each of which becomes a Data Series. If you choose more than one field for an Values (Y axis) dimension, consider plotting along a separate Axis. 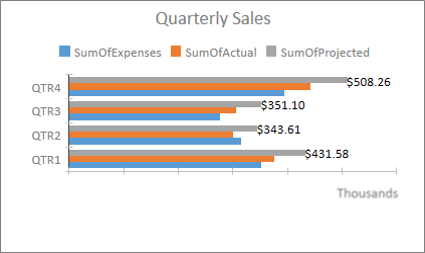 Access supports three types of column charts. Uses vertical columns to compare values across horizontal categories. Often used for a range of values (item counts), scales (survey ratings), and names (places or people). Similar to a clustered column chart but shows two or more data series in each column. Often used to show the relationship of the data series to the whole. Similar to a stacked column chart, but the column values add up to 100%. Often used to compare the percentages that each data series contributes to the whole. In a line chart, categories are distributed evenly along the horizontal axis (Axis (Category) property) and values are distributed evenly along the vertical axis (Values (Y axis) property). Typically, you choose one field for the Axis (Category) dimension and one or more fields for a Values (Y axis) dimension, each of which becomes a Data Series. If you choose more than one field for an Values (Y axis) dimension, consider plotting along a separate Axis. Access supports three types of line charts. Displays continuous, evenly-distributed data along both axes to compare values over time. Often used to show trends at equal intervals, such as months, quarters, or fiscal years and to compare two or more data series. Similar to a line chart but shows two or more data series in each line. Often used to compare related trends. Similar to a stacked line chart but shows trends as a percentage over time. Often used to compare related trends to the whole of 100%. Note On the Format tab in the Chart Settings pane, the following properties are unique to Line charts: Line Weight, Dash Type, Missing Data Policy, and Marker Shape. Tip If there are many categories or the values are approximate, use a line chart without markers. In a bar chart, categories are organized along the vertical axis (Values (Y axis) property) and values are organized along the horizontal axis (Axis (Category) property). Bar charts reverse the normal placement of the axis and values dimensions. Typically, you choose one field for the Axis (Category) dimension and one or more fields for a Values (Y axis) dimension, each of which becomes a Data Series. If you choose more than one field for an Values (Y axis) dimension, consider plotting along a separate Axis. Access supports three types of bar charts. Uses horizontal bars to compare values across vertical categories. Often used when axis labels are long, or the values are durations. 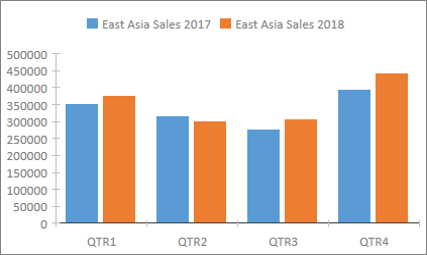 Similar to a clustered bar chart but shows two or more data series in each bar. Often used to show the relationship of the data series to the whole. Similar to a stacked bar chart, but the bar values add up to 100%. Often used to compare the percentages that each data series contributes to the whole. In a Pie chart, categories show as pie slices (Axis (Category) property). 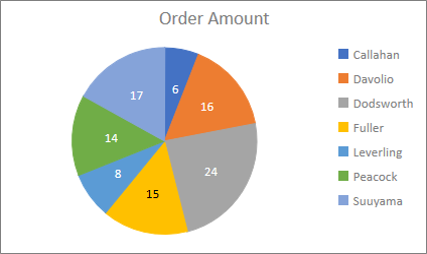 Data values (Values (Y axis) property) are summed as a percentage to a whole shown as the pie circle. Choose only one field for the Axis (Category) dimension and only one field for the Values (Y axis) dimension. Do not use the Legend (Series) field as the Axis (Category) field becomes the legend by default. On the Format tab in the Chart Settings pane, there is only one Data Series and only one property, Display Data Label. The colors used in the chart legend are set by default and can’t be changed. Access supports one type of pie chart. Shows the proportion of categories as a percentage to a whole. Best used for one data series of all positive values and less than ten categories. A Combo chart combines two or more chart types, such as a clustered column chart and a line chart, to explain different but related data. Access supports a Combo chart in which you can combine any of the other single chart types and map each chart to a different data series. 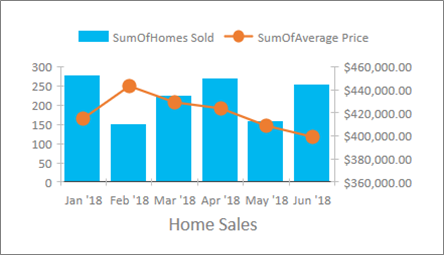 For example, map a clustered column chart to a data series of yearly home sales and a line chart to a data series of monthly average price by using the Data Series and Chart Type properties on the Format tab of the Chart Settings pane. You can also change any single chart to a Combo chart by changing the Chart Type property in the Data tab of the property sheet. Combines two different charts of your own choosing. Use the following guidelines to help you create the chart that you want and that is easy to understand. Have a game plan when you start. Look at various charts in books, reports, and the World Wide Web. Decide ahead of time which chart works best in your case and the look you want to achieve. Decide the fields that you want to show relationships for in the chart. Consider creating a query that limits the results to just the fields you need for the chart. As you build your chart, select dimensions one at a time. You can see the changes instantly and understand better how each field, dimension, and aggregation impacts the chart. Aim for simplicity when making the chart. Keep the number of data series small so that the user is not overwhelmed by too many numbers, columns, bars, or slices that are difficult to read. First get the data relationships and basic chart looking the way you want. 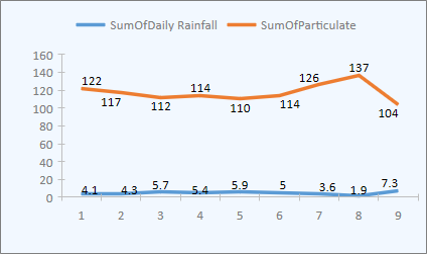 Then, format the chart and each data series. Be judicious when, choosing colors, editing text, and adding other chart elements. Aim for a balance between white space and meaning. Experiment with but minimize the use of gridlines, colors, special effects, labels, padding, and other formatting properties. Avoid bold text, dark colors, and excessive lines. When you think you are done, re-examine the chart to see if you have made the chart as simple and as clean as possible. Remember that "less is more".